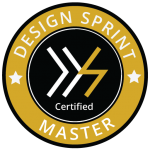 Short term remote sprints are a compressed version of the longer design sprints. This is ideal for groups with limited time and resources who need to see some progress on an idea. It’s a quick way to answer critical questions. Sprints help determine the direction of your organization by building consensus as a group and working toward a shared vision. The below table shows you a general format. The tasks are generally spread over over a couple weeks. and schedule a free 15-minute consultation today.